The Ensemble of the Ferapontov Monastery is a Russian-Orthodox monastic complex dating from the 15th-17th centuries, and its interior is considered one of the purest examples of Russian medieval art. The wall paintings were made by Dionisy, the greatest Russian artist of the end of the 15th century. My husband Ivan and I have visited this WHS on a very gloomy and rainy August day in 2013. We turned it into a day trip from Moscow – we took a night train to Vologda on Friday evening and returned via night train again on Sunday morning, which gave us one long day. In terms of accomodation, if you're on the budget, this can save you money spent on hotels for two nights. We walked from the train station to city centre, took some pictures, saw the church. Then we took a tour bus for a day tour that would take us to Ferapontov monastery and Kirillo-Belozersky monastery. It's a fair and reasonably priced option, they take you to both sites and even a lunch is included in the price. The only downside is that it's in Russian, the bus is full of Russian babushkas and the tour guides drives on an on about history of the sites in a minute detail, about the lives of saints related to these two monasteris and so on. We booked a place beforehand via phone and then paid the price at the office of the agency, which was located in the lobby of the Spasskaya hotel in Vologda. 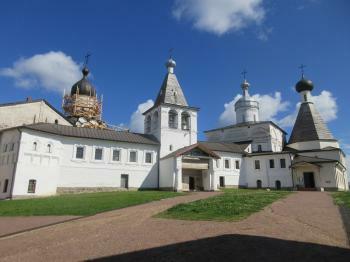 As for the Ferapontov monastery, I enjoyed the visit very much. The white and black ensemble perched on green grass by a river is very picturesque, if you overlook the state of slight disrepair of some parts. Founded in 1389 it has survived a lot. I appreciate this inscription and having seen many Russian churches, let me tell you the fact that the original frescoes have been so well-preserved and are under careful and delicate restoration process, is something very unique. As we have been told, the places where the mould has infected the frescoes have been identified and cleaned - those are the white dots. But unlike the usual practice of adding a fresh layer of colours to the frescoes once they start to fade, making them feel very unauthentic, this one is kept in its lovely washed-out state so we can see what it looked like six hundred years ago. And in instances like this one I really appreciate the efforts of preserving such gems for future generations. It is not easy to go to Ferapontov on your own. Although there are three buses daily from Vologda (direction Lipin Bor and Petrozavodsk), you have to walk around two kilometres from the bus stop. And the bus back to Vologda is either after 1-1.5 hours (hardly doable unless you are a very good walker) or after about 9 hours and the latter means long time of waiting in the middle of nowhere or trying to hitchhike (what I did successfully). The monastery of Ferapontov is the only one of many famous temples nearby that was inscribed as WHS. One of the reasons is that it is preserved with almost no changes since its creation in XIVth-XVth centuries. The monastery hold the masterpiece of Russian religious art - frescoes of Dionise, who is considered, after Andrei Rublow, second most important icon painter (or, as Russians say, icon writer). 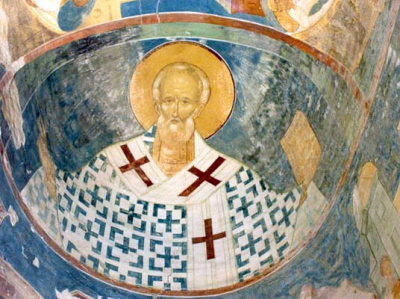 The frescoes are very well preserved, although constant restoration is going. Before going to the church you have you watch a short movie about the frescoes and their difficult restoration (scientists search original components of the paint, sometimes including gems). The movie is in Russian, I am not aware whether they have an English version. Beside the frescoes, it is worth visiting two remaining tserkvas and a small museum of icons (with much more interesting examples than many ones in the churches of Golden Ring). By the way, being in Vologda you cannot miss the beautiful St. Sophia Sobor. It has the biggest wall covered with frescoes in whole Russia and - which is extremely unlikely for this country - taking photos inside is available without limits. It is beautiful spiritual and historical place, very well preserved and maintained, resort for souls in thirst for genuine and eternal. Highly recommend to visit. If not in reality, just use web-site. When visiting Vologda this spring, we asked a local tourist-guide what to see and she recommended a trip to Ferapontov. As it was out of season we had a privat tour of the monastry by the director. What a place; so quiet and peaceful and the paintings in the church are absolutely amazing. This place is well worth the trouble getting there. The best way to see the monastry are to arrange with the infocentre in Vologda and it is relatively inexpencive to visit. Frescoes or murals by famous painters: By Dionisius (c. 1440 ? 1502), head of the Moscow school of icon painters at the turn of the 15th and 16th centuries. Extended from original TWHS: Originally only Rojdestva Bogoroditsy Cathedral. 21 Community Members have visited.